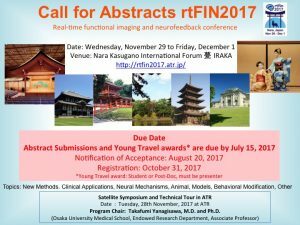 The third conference, rtFIN 2017, will be held in Nara, Japan from Nov 29th to Dec 1st, hosted by Dr. Mitsuo Kawato, ATR, Japan, who serves as the General Chair. This conference provides the most focused opportunity to influence the field of neurofeedback, from initiating neurofeedback standardizations to organizing international efforts towards clinical translation. 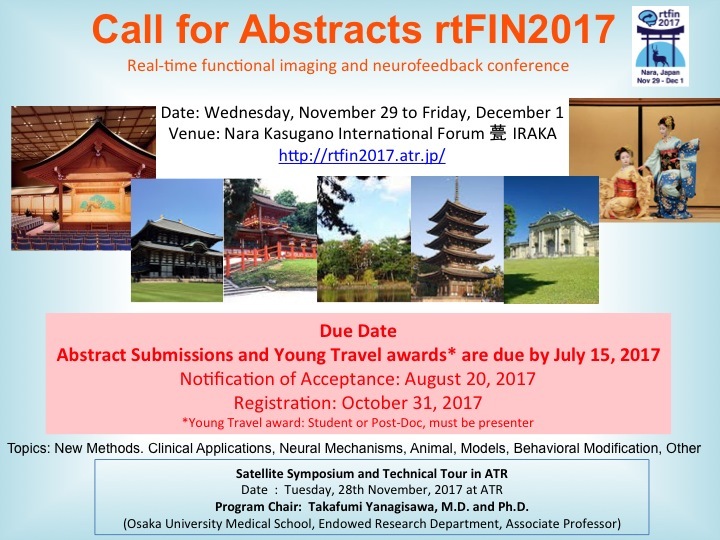 We are expecting your submission. The article about research of PLoS Biology was published in IEEE SPECTRUM, entitled Don’t Like Their Faces? Train Your Brain to Feel More Positive. Please check it. Press Release: Induced sensorimotor brain plasticity controls pain in phantom limb patients, in Nature Communications. Press Release: Learning to associate orientation with color in early visual areas by associative decoded fMRI neurofeedback, in Current Biology. Following article was published in Current Biology. Press Release: A Small Number of Abnormal Brain Connections Predicts Adult Autism Spectrum Disorder, in Nature Communications. Following article was published in Science. More detail about this research is available in 20130405_science_130405. Press Release: Perceptual learning incepted by decoded fMRI neurofeedback without stimulus presentation, published in SCIENCE.